This Week in Legacy — Guilds of Ravnica! Howdy folks! 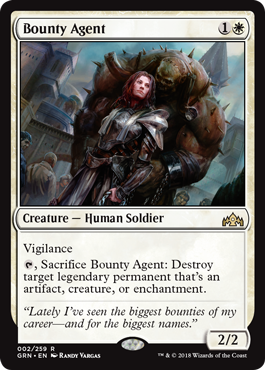 It's Joe again, and we took last week off so that we could wait for the full Guilds of Ravnica spoiler to be available before putting together a look at the newest Magic set through the eyes of Legacy and Vintage! Without further ado, let's dive right into the cards that make GRN interesting! This one should be relatively obvious—the Sphinx in the room I should say. Despite how bad I feel for old Isperia, the Golgari mage in me has me tickled pink over this card. 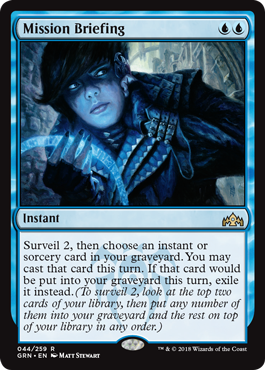 Suffice to say this is going to be a powerful removal option for multiple formats. 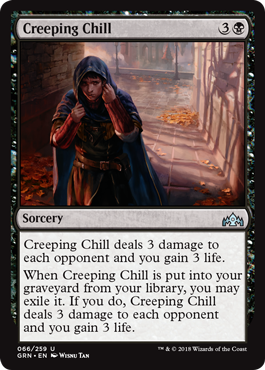 The downside of this card is very low in Legacy, however, it won't quite be replacing Abrupt Decay I feel. The uncounterable nature of Decay means that it will definitely still see some play, but Trophy does give BUG colors a lot of removal options. BUG may see a resurgence now, which means a resurgence in Leovold, Emissary of Trest decks. Suffice to say, this is a great card and will definitely find a home somewhere. Being able to destroy any permanent is a very powerful effect—especially at instant speed—and the downside is going to be very minimal. Snappy decisions aside, I really like the power level of this card. 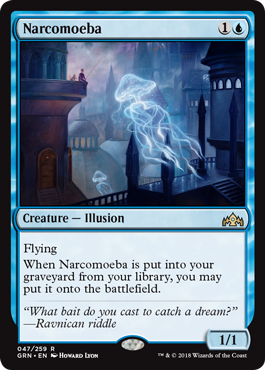 It has some intriguing implications and the comparisons to Snapcaster Mage and whether this is as good as that card are up in the air. Snapcaster being a creature definitely is relevant, but this card seems good in decks that want to be pure control and can also play around graveyard hate (since you don't choose the card until resolution). This is a very interesting design space, and I expect someone to play around with it somehow. This is one card I'm actually relatively happy to see. Modal effects on creatures are generally pretty good and this one is no different. Are you in Junk colors and playing Reclamation Sage? Welp, this card is basically 100 percent better. The only time that Reclamation Sage ends up being a better card is when you're in Elves and the creature type matters. 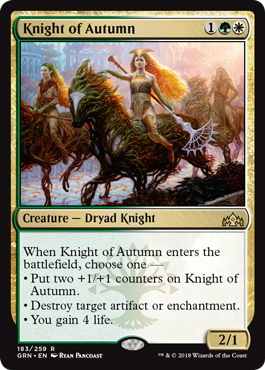 Otherwise, this Dryad does quite a bit: If you need a 4/3 for three you got it, if you need to destroy something you got it, and if you need to gain four life to stabilize, well, you've got it. There's very little downside to any of these modes and I expect to see this show up a fair amount in Nic Fit and Maverick lists (decks that run Green Sun's Zenith). 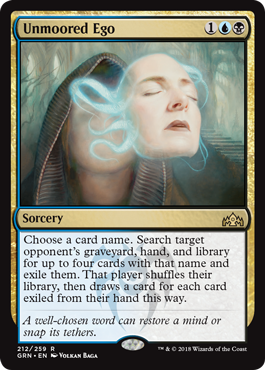 Extraction effects are generally fairly powerful versus combo decks and the like, and it's not uncommon to see cards like Lost Legacy in the format (even B/R Reanimator has played LL to hunt out hate cards). Unmoored Ego is basically a much better version of LL with the obvious notation that you have to be playing Blue and Black to cast it. That being said, Unmoored Ego hits four copies of any card name, which can be utterly devastating versus combo decks. Seems hilariously loose, but people are talking about this card in regards to an old school deck called Stiflenaught, which uses Stifle and [[Phyrexian Dreadnaught]] to power out an early 12/12. 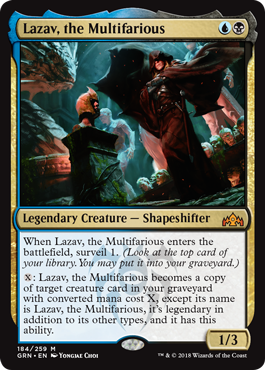 As it turns out, Lazav can become a copy of a dead Dreadnaught for one mana. Is this a thing? Who knows!? It's a Human, it costs two, and it's White. Vial in on end step untap blow up something relevant that's legendary? Seems not so bad to me. Not sure if this will see play or not, but it does have some applications. I'm not really sold on this card personally. People have talked about this a tiny bit in Vintage Dredge world, and I don't think it's actually any good. Yes, it does do an uncounterable Lightning Helix, but any amount of drawing this card makes it so completely dead and the possibility of opening up a hand with multiples makes you feel rather awful, and you would have to run at least three of these to make it feel even remotely relevant. Who would win: A 15/15 tentacly space monster from the Blind Eternities or one Cratery Boi? I'll let you decide. 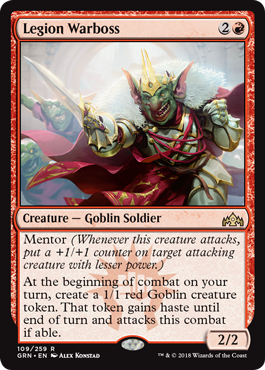 Also, obligatory Goblin card. They've been doing that a lot lately, and I approve. This card is actually fairly interesting to me, mainly because while it doesn't get the boost from attacking that Goblin Rabblemaster does, it also doesn't suffer from the problem of having to attack itself if you have multiples like Rabble-Rabble does. 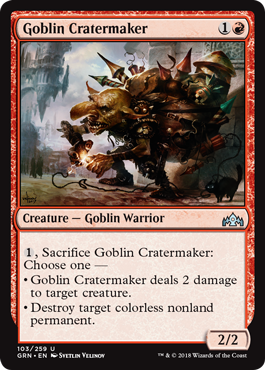 This could easily find its way into some of the mono-Red stompy decks looking for an alternative three-drop that is like Rabble, but able to hang back and defend too. 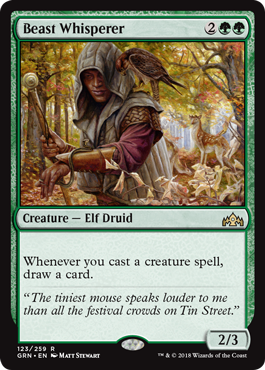 While this card is a beast at four mana, Glimpse of Nature on a 2/3 with a relevant creature type (ELF!) is not a bad card. However, this could be too pricey to set up and play around with, but who knows? 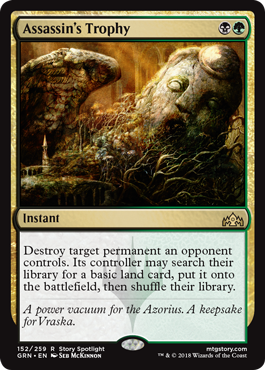 The design space of this card is kinda wild, and while it may not seem like there would be a deck for this, I can think of one Legacy deck that might actually be okay with this: Sylvan Plug, a Chalice-Tomb Green/Black Stompy deck that often plays stuff like Obstinate Baloth. 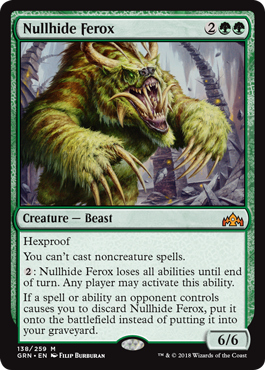 Your opponent being able to shut off the hexproof is meh, but I think the upside of a 6/6 for four mana isn't awful in a deck that's predominantly early lock pieces and then pure beaters. 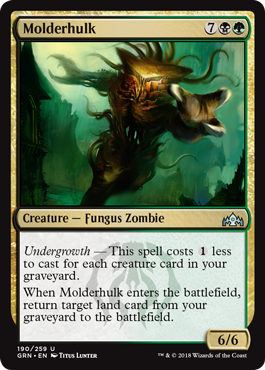 This is actually a card I'm more excited about for Vintage primarily, because it's basically a Yawgmoth's Will for your opponent's graveyard. While the ceiling on this in that format is obviously insane (getting to snag anything like a Black Lotus, Ancestral Recall, or Time Walk is gross), the floor on it is also super low. 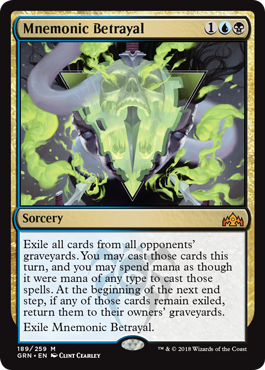 I could see this as a sideboard card maybe for Paradoxical Outcome decks as a way to use their opponent's graveyard to go off. Either way, the effect and the design space are both interesting. This is another card looking through the eyes of Vintage. It's Black so it can be fed to Ichorid, its ETB trigger gets back Bazaar of Baghdad, and in a pinch you're likely to be able to cast this for BG and get back your Bazaar at the same time. Is this better than Sun Titan? Probably needs some testing, but it does look pretty doggone good to me. 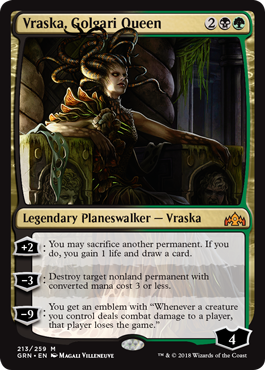 All hail Queen Vraska! As a Nic Fit player, I'm actually reasonably happy with this card. Four-mana Planeswalkers are generally very good, and I like Vraska's spread of abilities very much. I will definitely be playing around with this card and seeing how I like it in various Nic Fit builds. That's all the time we have this week folks! I am actually fairly happy with Guilds of Ravnica as a set. It's giving a lot of love to older formats and decent cards for Modern as well. It will be exciting to see how the future Ravnica sets shape up when we get to my OTHER favorite guilds (Simic and Gruul) in Ravnica Allegiance.